Communities across the country have been developing Class I off-street paved bike paths for many years. Trails in Minneapolis, Portland, and Palo Alto are used year around. Los Angeles and Orange County have hundreds of miles of multi-use paths along rivers and beaches. In 2006, land developers in the Coachella Valley recognized an increase in value when properties were in close proximity to paved paths. LeGrand Velez helped establish the nonprofit Coachella Valley Community Trails Alliance (CVTA), which had a mission to promote an off-street trail from Palm Springs to the Salton Sea. CVCTA encouraged all Coachella Valley cities to address bicycle issues in the Circulation Element of their General Plan. The Alliance also promoted the idea of a paved path along the Whitewater River, normally a dry wash that provides flood control and acreage for golf courses in several cities of the Coachella Valley. In 2010, a Coachella Valley non-motorized transportation plan was completed. Because of the many golf courses in the valley, the plan allowed local cities to designate certain low-volume streets or sidewalks for golf cart operation. A year later, civic leaders realized that a multi-use trail connecting all the communities would provide a safer way to travel. In addition, the use of non-polluting electric vehicles, bicycles, and walking would contribute to a cleaner environment. The Coachella Valley Association of Governments (CVAG) hired Velez to move the concept of a valley-long off-street trail to a real transportation corridor. By 2012 the preliminary study was complete and distributed among the cities for review. The study offered two potential names for the facility: “Parkway 1e11” or the “Whitewater River NEV/Bike/Pedestrian Corridor.” In November 2013, CVAG announced that the corridor would receive its first budget for planning and managing environmental studies. The first public comments were solicited in December, and detailed engineering plans were begun. By June 2014 the route was specified along with several alternatives at more congested urban points, and the route received a new name: CV Link. Having realized the main mission of CVCTA had been accomplished, the Alliance was transformed into Friends of CV Link. As CV Link develops, the Friends continue to promote the trail and encourage visitors and local citizens to enjoy the many benefits CV Link has to offer. The Friends develop volunteers to assist where needed. After incorporating many comments from cities, businesses, and citizens, CVAG published a final master plan in March 2015 and a preliminary environmental study in January 2017. Two valley cities dropped out of the CV Link route, after placing the question to the vote in Rancho Mirage and Indian Wells. The environmental study was approved by CVAG members in May 2017, and construction began on the first segment. This segment was completed in February 2018, and its route from northeastern Palm Springs to western Cathedral City is a rousing proof of the concept. Subsequent planning continues for the other eight cities, and each segment will start construction from 2018 to 2020. After a dozen years, it is time to enjoy CV Link and watch it grow to connect all the cities in the Coachella Valley. Meetings of the board of Friends of CV Link are normally held the first Thursday of every month (excluding Summer) at 5:30PM at the Palm Desert Public Library, 73300 Fred Waring Drive, Palm Desert, CA. The public is welcome to any of our meetings. Please inquire with us, as meeting dates or times may change. The board follows the Friends of CV Link Bylaws. Letitia moved to the Coachella Valley in 1979 from New York, immediately fell in love with the area and established roots here. Her very first job was at the Palm Springs Public Library where she worked as an audio-visual clerk. Letitia’s career path led her to retail and commercial property management and she left the valley in 2001 to pursue opportunities in the Los Angeles and Orange County areas. After retiring in 2011 because of a spinal cord injury, she now resides in Cathedral City. Letitia created a website to raise awareness, provide support and information to those who have also been diagnosed with Transverse Myelitis as she was in 2010. Her road to recovery is documented at www.TransverseMyelitisRecovery.com. She is also the creator of RefocusedLives.org, a website highlighting people worldwide who are moving beyond their boundaries and showing the world that having a physical disability does not mean that they lack ability. Letitia serves as a board member for Desert Ability Center and organizes local rides for para-cyclists with The Cycle Crew, whose goal it is to provide opportunities for people living with injuries or disabilities to get out into the community, be active, and live happy and productive lives. Letitia is the proud mother of a lovely daughter, and she is a serious photo enthusiast. 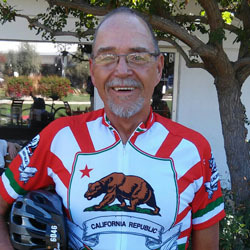 Gary lives an active lifestyle and began riding bicycles in the early ‘70’s for sport, pleasure, and errands. He has ridden in Europe and many cities in the U.S. and quickly realized that off-street bike trails are much safer than riding with cars. His advocacy work began when serving as president of the local Desert Bicycle Club by encouraging Coachella Valley cities to improve cycling by installing bike lanes and better signage. He served as a board member on the Coachella Valley Community Trails Alliance since 2007 and has been instrumental in the changeover to the nonprofit Friends of CV Link. 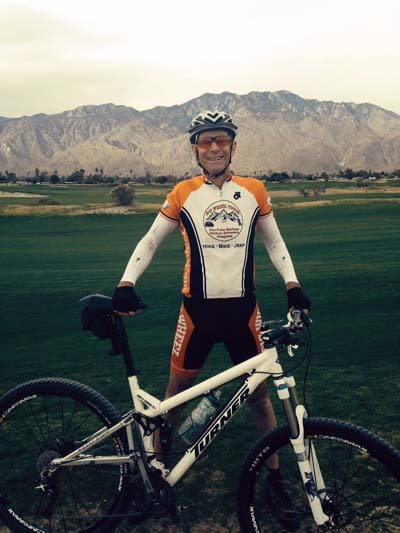 He is also a member of CVAG’s Citizens Advisory Group for CV Link; serves on the CVAG Trails Management Sub-Committee; and is a board member on the Desert Trails Coalition. Gary was a USAF pilot in Vietnam, is a retired American Airlines Captain, lives in Rancho Mirage with his wife Shirley, and has 2 children and 5 grandkids. Contact Gary at his personal email. Jim an avid bicyclist, had his first bike ride on a neighbor’s new bike in 1950 when he was seven years old. He loved the freedom it gave him and then his parents bought him a three speed Hercules English road bike. He rode it everywhere in the south Los Angeles area until he got his driver’s permit at 15 ½. 10 ½ years later, after a stint in the Army in Vietnam and as a student at Cal State Long Beach, his wife bought him a new Raleigh 10 speed road bike. He loved the freedom it gave him. He commuted to work and school on his bike and in 1975 upgraded to a beautiful Motebecane 10 speed road bike and continued his commuting and recreational riding. Upon retiring in 2006 he upgraded again to his current Trek 1600 and rides recreationally whenever he can. He hosts a cycling blog: http://desertroadkill.blogspot.com/ and advocates for safe cycling in the Coachella Valley. He is consistently amazed at how hard a two or three hour drive in a car can be when compared to the joy he experiences on a two or three hour bike ride in our beautiful desert. Mary has been coming to the desert for about 20 years, and has been waiting desperately for an off road, paved trail to go from one end of the valley to the other. She has lived in the midwest, south, and now the west and seen the advantages of cities that provide resources encouraging active, healthy lifestyles. A “hiker with a biking problem”, Mary is a hike leader and on the Executive Council of the Coachella Valley Hiking Club, and a member of Friends of the Desert Mountains. Living part time in Park City, Utah, Mary also volunteers for the Wasatch Mountain Hiking Club and other non-profit organizations. Mary’s professional career included management consulting, training and development, and human resource management. She recently retired as the Vice President of Human Resources for a medical device company. Mary can be reached at her personal email. Ernie spent the bulk of his life in the Pacific Northwest, having moved to the Coachella Valley in 2010 to retire. His professional life was spent mostly as Controller of University Volkswagen Audi in Seattle, having retired after 25 years. Having always been impressed with and a frequent user of the Burke-Gilman Trail in King County, he was instantly excited about the prospects of a 50 mile car-free trail between Desert Hot Springs and the Salton Sea. He has only returned to biking since retiring. In addition, finding a place to ride where he did not have to always be competing with cars made biking irresistible. He has since become much more comfortable co-existing with cars and biking on the highways, but feels the CV/Link in a worthy project to support. He feels the future of tourism in the Coachella Valley will transition from a golf focus toward more environmental, space, and water friendly activities like biking, walking, hiking, and running; plus all the activities enabled by the revival of the Salton Sea.